"You can't grow an avid golfer in a quarter"
A couple of interesting columns have rolled in from the PGA Show and focusing on the rosy economic picture recently painted by some of the game's leaders. So why the undercurrent of pessimism about the golf industry? 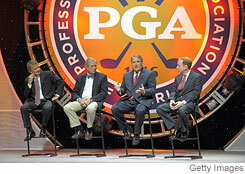 Joe Steranka, chief executive of the PGA of America, which sponsors the show, suggests that the industry's outlook became a bit skewed starting in the 1990s. Many well-known golf businesses were gobbled up by investor-owned companies, which focused on short-term earnings. "You can't grow an avid golfer in a quarter," he said. "For a while there, I think some in the industry lost sight of what the game needed for its long-term good." The possible looming recession may have only a minor effect on golf, argues Mr. King at TaylorMade. For one thing, more and more baby boomers are entering their prime golf-playing years. "The fact is that when people can't afford bigger vacations or fancier cars, they still make smaller purchases for recreation," he said. "Sometimes it means they even play more golf than they did when times were better." Macro-economic studies like this serve a useful industry function in that they help generate public attention and set the stage for legislative lobbying efforts and behind-the-scenes policy bargaining. That’s precisely one purpose of this report. It will certainly be part of a widespread golf industry show and tell effort in Washington on April 16, National Golf Day. Similar, state-by-state studies have also been completed for Iowa, Louisiana, Michigan, Minnesota, Ohio and Virginia. They can help steer public policy toward pro-golf, pro-tourism efforts, and they can be powerful tools for impressing legislators and policy-makers when it comes time to decide upon water allocation, land use, tax rates and zoning provisions. Perhaps the biggest issue facing the golf industry, which went unmentioned in the report or in the news conference accompanying its release, is the vast dependence of maintenance crews and clubhouse operations on immigrant labor for staffing. If the golf industry can effectively lobby for immigration reform to assure a steady supply of legal workers, that would be a major legislative achievement. But some of the numbers here in this report seem inflated, with suspect counting rules that create an unduly rosy picture. For example, the $28 billion in golf-facility operations includes weddings, banquets and all food and beverage operations. Why all of this should be attributed to golf is a legitimate question, because folks would be having meals and banquets somewhere, and it’s not as if golf created that expenditure.